Located on the Stave-Pitt divide, on the southeast side of Corbold Creek. Access is by boat to the head of Pitt Lake, then by logging roads along Corbold Creek. 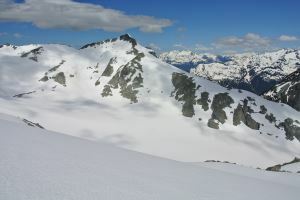 Cross the pass west of Remote Peak to reach the Piluk Glacier. Scramble up the southeast face to reach the summit.